PLAN OF A Street Proposed FROM CHARING CROSS TO PORTLAND PLACE. Plan, presented to the House of Commons, of a street proposed from Charing Cross to Portland Place, leading to the Crown Estate in Mary-le-Bone Park. 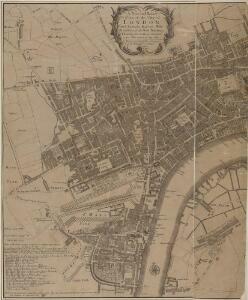 A SURVEY OF THE CONDUITS &c. to WHITEHALL, St.JAMES &c.
ST. GEORGE'S PARISH, HANOVER SQUARE. 1 : 8448 This plan of the Parish of St George is surrounded by views of St George's church, Knightsbridge chapel, Conduit Street chapel, Chelsea chapel, Audley Street chapel and Berkeley chapel, the whole set within a decorative border. The title and imprint appear at the foot of the plate. The Parish of St George was created in 1725 and covered an area previously in the Parish of St. Martin-in-the-Fields that stretched from Regent Street (then called Swallow Street) to the Serpentine, and from Oxford Street to Mayfair, Belgravia and Pimlico. Bickham, J. Description: This map of the West End of London is part of Henry Overton's complete map of London and its suburbs, published in 1720.The title and publisher's imprint appear in cartouche in the centre, with fares of hackney coaches and an overall key at bottom left. The compass rose appears in the river, with parish boundaries outlined in colour. Henry Overton took over his father John's publishing business in 1707 and continued to publish maps from the same address at White Horse near Newgate.